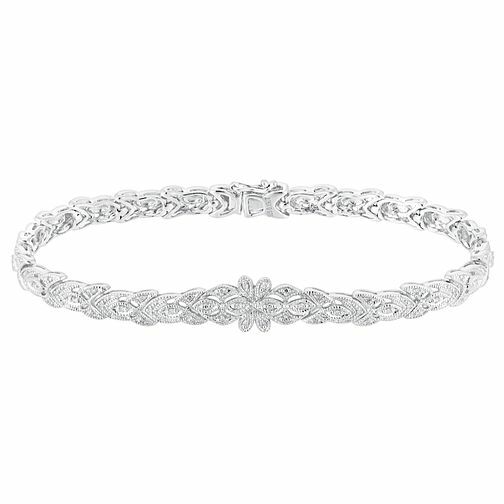 Crafted in sleek sterling silver, this opulent bracelet is finished in a strikingly intricate design and set with glittering diamonds totalling 15 points of a carat. A beautiful gift for someone special, and perfect for adding a touch of glamour to every occasion. Sterling silver 15pt diamond bracelet is rated 5.0 out of 5 by 1. Rated 5 out of 5 by Anonymous from Stunning My Husband bought this for me as a gift for christmas, it is beautiful, catches the light perfectly. It is a lovely bracelet, the only issue I could see with this is if you have small wrists you may feel like you are going to lose it.